December 02, 2016, 9:24 a.m. While switching is on the increase, at the moment it is being held back because too many consumers think it simply isn’t worth it. Data from the Utilities Tracker Wave 7 report finds that 44% of consumers say they are unlikely to switch utilities provider in the next 12 months. 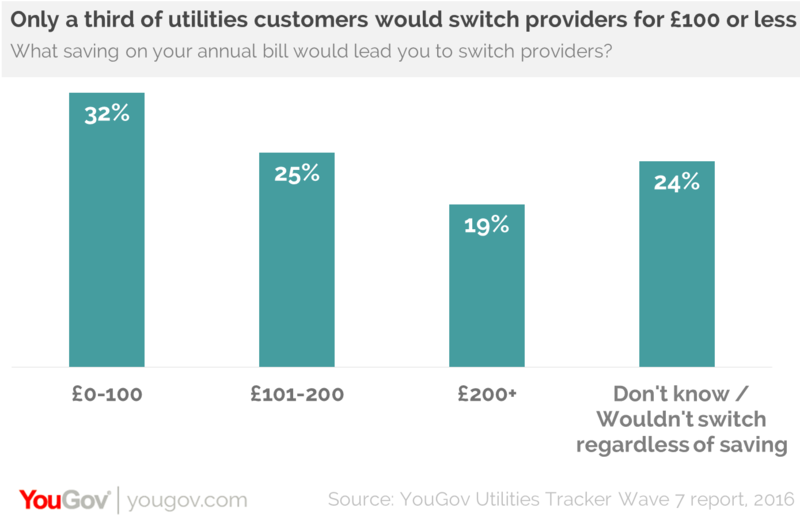 Of this group, one in five (19%) think that any savings they make from changing supplier “aren’t really worth the hassle” and approaching three in ten (28%) don’t believe that switching provider would trim their energy bills. The real challenge for utilities providers is to demonstrate that changing supplier gives people a big enough benefit to make it worthwhile. Part of the problem is that consumers themselves place high demands on energy companies. Unless providers can demonstrate that they can make big savings, many just aren’t interested. Approaching a third (32%) would switch for £100 or less, a quarter (25%) would need to save £101-200 and around one in five (19%) say that they would want to see savings of over £200 a year in order to change supplier. A further 24% either didn’t know (17%) or wouldn’t switch regardless of the benefit (7%). The report also suggests that a large number of current or potential switchers are particular types of consumer. Many who have changed providers are environmentally conscious, with over a third (37%) stating that they turn lights off when they leave a room. Additionally, approaching half (46%) make an effort to recycle. Furthermore, they look for a good deal, being key users of price comparison sites. Among the top 100 brands of those that are likely to change utilities suppliers are the consumer saving sites uSwitch.com, moneysavingexpert.com, MoneySupermarket.com, CompareTheMarket.com and Which?. Naturally, there are only a finite number of people that fall into these groups. To make switching a mass market pursuit providers need to make their case beyond these sets of consumers and speak to them in a way that encourages them to change supplier. It will not be easy. With so many consumers thinking that savings of less than £100 are not worth the trouble of switching, providers will have to go to great lengths to convince households that changing provider will lead to them having more money in their pockets.